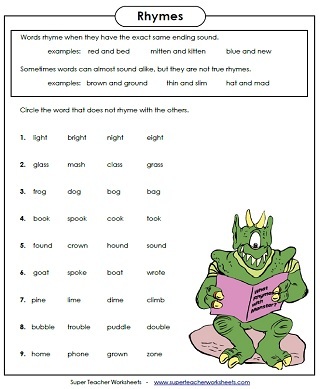 Download and print worksheets for teaching rhyming skills. Worksheets are separated into two levels basic and intermediate. 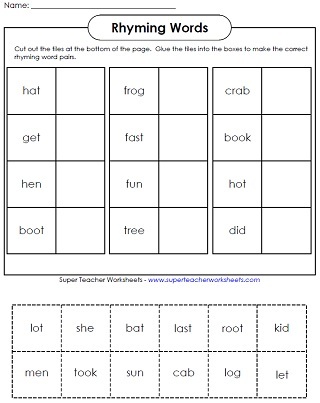 Printable activities on this page include cut-and-glue rhyming worksheets, mini-books, matching lessons, and word webs. click on the common core symbol . 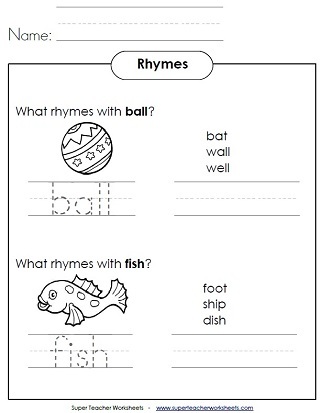 Write the words that rhyme with ball, fish, tent, and duck. Find and write the words that rhyme with book, tree, crab, and fox. Find and write the words that rhyme with chick, plane, ship, and shell. Draw lines to connect the rhyming pictures (cake-snake, duck-truck, bee-key). Draw lines to connect the rhyming pictures with straight lines (chair-hair, parrot-carrot, tree-three). Color the words that rhyme with cat. Color the words that rhyme with pig. Color the words that rhyme with tree. Color the matching words that rhyme with book. Write the words that rhyme with ball, nest, bat, star, and truck. Write the words that rhyme with corn, pear, pie, cake, and nuts. Write the words that rhyme with rat, pig, frog, snake, and bear. Cut out the word boxes and glue each next to its rhyme. In this story, two children invent a fun rhyming game. This file includes a story, reading comprehension questions, a vocabulary match activity, and a writing page. One word from each row does not rhyme with the others. Circle the one that does not belong. Cut out the word boxes and glue each one next to its rhyme. View our complete collection of reading and writing worksheets. We have hundreds of worksheets specially designed for kindergarten students. Topics include colors, shapes, letters, and counting.